Thank you for using our theme. If you have any questions that are beyond the scope of this following instructions, please feel free to post your queries via our support forum. Thank you so much! Log in to the WordPress dashboard. Click on Add New and then search for Wowsome. Click on Install button and then activate it. Unzip wowsome.zip to your desktop. Using an FTP client to access your host web server. Go to /wp-content/themes/. Upload Wowsome theme to /wp-content/themes/. Go to Appearance > Themes and activate Wowsome theme from Dashboard. This theme supports Custom Menu. You can set it through the following steps. Give your menu a name and build it up using little widgets on the right. You can add Pages, Posts, Custom Links, Categories and Format. Now simply select the Display Location to Primary Navigation for your newly created menus using a widget on the left. Afterwards, click Save. See Menu Help for more information. This theme supports Social Profiles menu. You can set it through the following steps. 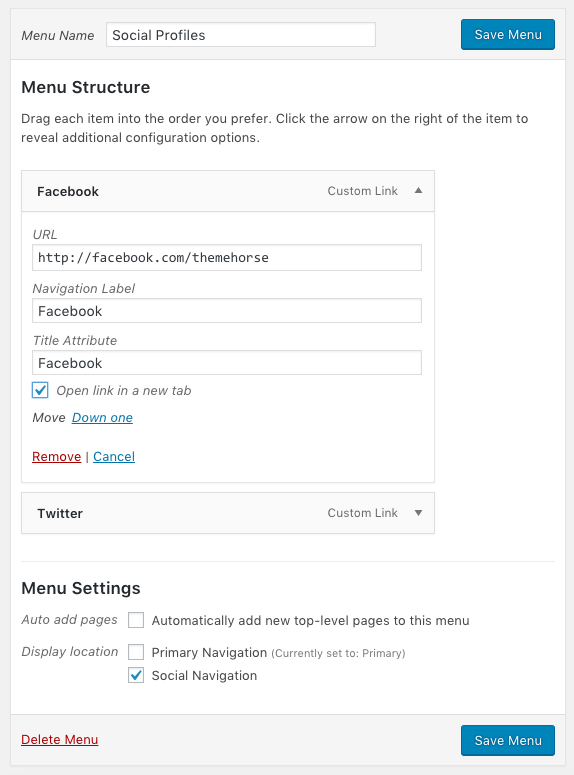 Create a new menu with any name you like and add your social profiles URL’s as Custom links shown in below screenshot. Now simply select the Display Location to Social Navigation and click on Save Menu button as shown in above screenshot. This theme supports Custom Header Feature. From this option you can set image in the header. Go to Appearance > Customize > Header Image. Click on Add New Image button to select the image. Click on Select and Crop button. Crop the image according to your wish and click on Crop Image button. Click on Crop and Publish button then click on Save & Publish button. This theme supports Custom Background Feature. From this option you can set image for your background. Go to Appearance > Customize > Background Image. Click on Select Image button. After that select the image from your media library and click on Choose button. Then click on Save & Publish button. You can see the preview on the same setting page as well. Click on Save & Publish button. Note: The background effect will only seen if you set the Layout Options > Site Layout option to Narrow Layout instead of Wide Layout. This theme allows you to choose the specific layout for every post and every page display. To set the layout for Post/Page follow the steps give below. Go to Posts/Pages > All Posts/All Pages. You will see a box named Select layout for this specific Post only. in belower part of the text editor box. If you don’t find it, click on the Screen Options in the right top part and check on the Select layout for this specific Post only to show its option. If you select Default Layout Set in Customizer option, the layout set in Layout Options > Content Layout, will be the layout for this post as well. You can select from No Sidebar, No Sidebar, Full Width, Left Sidebar and Right Sidebar to be this post’s specific layout and click on Update button. If you want to add/edit some CSS, you can follow the instructions below, your custom CSS will overwrite the theme’s CSS. Go to Appearance > Customize > Additional CSS. Write your Custom CSS there and click on Save & Publish button. Go to the specific page on which you want to turn off the comments from dashboard. Look for the Discussion box somewhere below the editor box. If you don’t find it, click on the Screen Options in the right top part and check on the Discussion box and then discussion box will appear below the page editor. Uncheck the Allow Comments box in the Discussion box and click on Update button. First create a page with any name or you can set your any existing page to Business Template. Follow the instruction below to set the Business Template for your page. 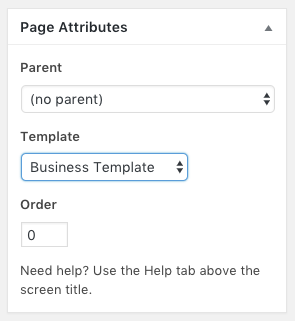 To set the page to Business Template go to page editor and you will see the Page Attributes box at the right side. Choose Business Template from the dropdown as a Template as shown in below screenshot. After setting up the page to Business Template now go to Settings > Reading to set this page as your Home Page (Front Page). Choose A static page (select below) option as your Front Page Displays and choose your page that you have set template to Business Template from the dropdown in Front Page as shown in the below screenshot. After setting up the Business Template page as you Home Page (Front Page) now go to Appearance > Widgets. Drag and Drop any TH custom widgets i.e. (TH: Our Clients and TH: Services to the Business Template Section and set up all the data/content accordingly in all the widgets that you have dropped. Click on Save button. Now you can see your Home Page (Front Page) as Business style. From this options you can set Site Layout and Content Layout. To set it go to Appearance > Customize > Wowsome Theme Options > Layout Options. From this option you can set Wide or Narrow Layout for your site. Every Page/Post that don’t have their specific layout will follow this default layout. Archives (i.e. category pages) will also follow this default layout. You can select any of this layout Right Sidebar, Left Sidebar, No Sidebar and No Sidebar Full Width for your Page/Post as a default layout. From this options you can set Contact Info Bar in the header. To set it go to Appearance > Customize > Wowsome Theme Options > Header Options. From this options you can set Featured Post Slider. To set it go to Appearance > Customize > Wowsome Theme Options > Featured Slider Options. 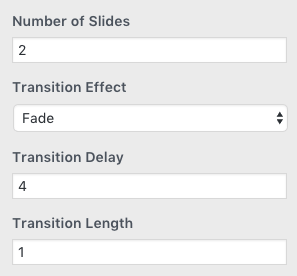 Enter the Number of Slides, Select Transition Effect and Enter Transition Delay/Length accordingly as shown in the below screenshot. If you want to disable the slider check on Disable Slider option. Also to exclude slider post from homepage posts check on Check to Exclude box and click on Save & Publish button. Now go back and you will see Post Slider Options where you can set the slide by entering the post ID as shown in the below screenshot and click on Save & Publish button. 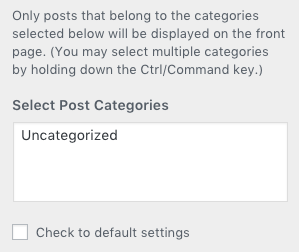 From this options you can show the specific categories post only in Home Blog/Front Page. To set it go to Appearance > Customize > Wowsome Theme Options > Home Page Blog Category Setting you will see the below options. Select your post categories from Select Post Categories option to show it on Home/ Front Page. You can also select multiple categories by holding down the Ctrl/Command key. To disable it check on Check to default settings box and click on Save & Publish button. From this options you can hide site title and set the side by side design style for the footer. To hide the site title from the footer check on Hide Site Title option. To set the side by side design style for the footer check on Copyright Info/ Social Profile display side by side option.